“Thank you so much for your help in solving my saddle nightmare. My 6 year old Hanoverian mare has always been very, very sensitive. She had a choppy right canter and was inclined to change behind as she went round corners. Changing from a tree to a SMART SPORT VT RigidFree saddle seems to be a miracle cure. On the final day of our extended saddle trial, we went to a competition and scored 7s for all her medium trots and canters (she's only just started these so delighted!) Even though she needs to build strength and learn to relax the difference is phenomenal! 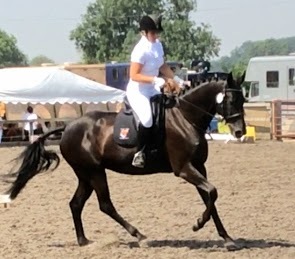 Nicola Nisbet has kindly sent in these two videos showing her horse before and after starting to use the SMART SPORT VT Dressage saddle. There are just 3 weeks between them yet the difference is quite remarkable.